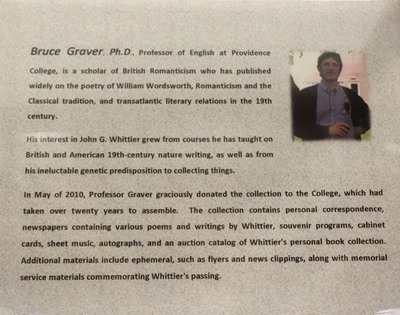 Bruce Graver, Professor of English at Providence College, is a scholar of British Romanticism who has published widely on the poetry of William Wordsworth, Romanticism and the Classical tradition, and transatlantic literary relations in the 19th century. His interest in John G. Whittier grew from courses he has taught on British and American 19th-century nature writing, as well as from his ineluctable genetic predisposition to collecting things. In May of 2010, Professor Graver graciously donated the collection to the College, which had taken over twenty years to assemble. The collection contains personal correspondence, newspapers containing various poems and writings by Whittier, souvenir programs, cabinet cards, sheet music, autographs, and an auction catalog of Whittier's personal book collection. Additional materials include ephemeral, such as flyers and news clippings, along with memorial service materials commemorating Whittier's passing.